In this paper, we obtain a formula for the derivative of a determinant with respect to an eigenvalue in the modified Cholesky decomposition of a symmetric matrix, a characteristic example of a direct solution method in computational linear algebra. We apply our proposed formula to a technique used in nonlinear finite-element methods and discuss methods for determining singular points, such as bifurcation points and limit points. In our proposed method, the increment in arc length (or other relevant quantities) may be determined automatically, allowing a reduction in the number of basic parameters. The method is particularly effective for banded matrices, which allow a significant reduction in memory requirements as compared to dense matrices. We discuss the theoretical foundations of our proposed method, present algorithms and programs that implement it, and conduct numerical experiments to investigate its effectiveness. The increasing complexity of computational mechanics has created a need to go beyond linear analysis into the realm of nonlinear problems. Nonlinear finite-element methods commonly employ incremental techniques involving local linearization, with examples including load-increment methods, displacement-increment methods, and arc-length methods. Arc-length methods, which seek to eliminate the drawbacks of load-increment methods by choosing an optimal arc-length, are effective at identifying equilibrium paths including singular points. In previous work  , we proposed a formula for the derivative of a determinant with respect to an eigenvalue, based on the trace theorem and the expression for the inverse of the coefficient matrix arising in the conjugate-gradient method. In subsequent work  - , we demonstrated that this formula is particularly effective when applied to methods of eigenvalue analysis. However, the formula as proposed in these works was intended for use with iterative linear-algebra methods, such as the conjugate-gradient method, and could not be applied to direct methods such as the modified Cholesky decomposition. This limitation was addressed in Reference  , in which, by considering the equations that arise in the conjugate-gradient method, we applied our technique to the LDU decomposition of a nonsymmetric matrix (a characteristic example of a direct solution method) and presented algorithms for differentiating determinants of both dense and banded matrices with respect to eigenvalues. In the present paper, we propose a formula for the derivative of a determinant with respect to an eigenvalue in the modified Cholesky decomposition of a symmetric matrix. In addition, we apply our formula to the arc-length method (a characteristic example of a solution method for nonlinear finite-element methods) and discuss methods for determining singular points, such as bifurcation points and limit points. When the sign of the derivative of the determinant changes, we may use techniques such as the bisection method to narrow the interval within which the sign changes and thus pinpoint singular values. In addition, solutions obtained via the Newton-Raphson method vary with the derivative of the determinant, and this allows our proposed formula to be used to set the increment. The fact that the increment in the arc length (or other quantities) may thus be determined automatically allows us to reduce the number of basic parameters exerting a significant impact on a nonlinear finite-element method. Our proposed method is applicable to the decomposition of dense matrices, as well as to the decomposition of banded matrices, which afford a significant reduction in memory requirements compared to dense matrices. In what follows, we first discuss the theoretical foundations of our proposed method and present algorithms and programs that implement it. Then, we assess the effectiveness of our proposed method by applying it to a series of numerical experiments on a three-dimensional truss structure. Equation (10) indicates that must be computed for all matrix elements; however, for matrix elements outside the bandwidth, we have , and thus the computation requires only elements within the bandwidth. This implies that a narrower bandwidth gives a greater reduction in computation time. This equation demonstrates that the derivative of the determinant may be computed from the elements of the inverses of the matrices D and L obtained from the modified Cholesky decomposition. As noted above, only matrix elements within the a certain bandwidth of the diagonal are needed for this computation, and thus computations even for dense matrices may be carried out as if the matrices were banded. Because of this, we expect dense matrices not to require significantly more computation time than banded matrices. By augmenting an decomposition program with an additional routine (which simply adds one additional vector), we easily obtain a program for evaluating the quantity . The value of this quantity may be put to effective use in Newton-Raphson approaches to the numerical analysis of bifurcation points and limit points in problems such as large-deflection elastoplastic finite-element analysis. Our proposed method is easily implemented as a minor additional step in the process of solving simultaneous linear equations. We first present an algorithm for dense matrices. The arrays and variables appearing in this algorithm are as follows. We next present an algorithm for banded matrices. The banded matrices considered here are depicted schematically in Figure 1. In what follows, denotes the bandwidth including the diagonal elements. the arc-length method of nonlinear analysis, we conducted numerical experiments on a three-dimensional truss (Figure 1). We first describe the nonlinear FEM algorithms used in these numerical experiments. In nonlinear FEM methods   , the matrix determinant vanishes at singular points, indicating the presence of a zero eigenvalue. The existence of a formula for the derivative of the determinant with respect to an eigenvalue makes it easy to identify singular points, using the fact that the sign of the derivative changes in the vicinity of a singular point. Within the context of the arc-length method, we apply a search technique (such as the bisection method) to narrow the interval within which the sign of changes and thus to pinpoint the location of the singular point. Of course, this calculation could also be performed by counting the number of negative elements of the diagonal matrix D arising from the decomposition. Moreover, the solution obtained via Newton-Raphson varies as , and hence we may use the quantity as an increment. The fact that the increment in the arc length (or other quantities) may thus be determined automatically allows us to reduce the number of basic parameters exerting a significant impact on the nonlinear finite-element method. However, in the numerical experiments that we have conducted so far, we have found that accurate determination of singular points, such as bifurcation points or limit points, requires, in addition to values of the quantity , the imposition of constraints on the maximum values of the strain and/or the relative strain. For example, if we are using steel, we impose a strain constraint. Choosing the smaller of and this constraint value then allows the singular point to be determined accurately. Aggregating all the considerations discussed above, we arrive at the following arc-length algorithm for identifying singular points along the main pathway. (5) Recall data from previous step (node coordinates, cross-sectional performance, displacement, strain, stress, , etc.). (6) Compute tangent stiffness matrix. (7) Compute the decomposition (including the computation of and the number of negative elements of the diagonal matrix ) and the solution to the simultaneous linear equations. (8) Choose the new arc length to be the smaller of the absolute value of the following two quantities: (a) the value obtained from the arc-length method and (b) . Within the iterative process, adjust as necessary to ensure that the maximum value of the strain satisfies the strain constraint. Compute the incremental strain and the total strain. (9) Use the constitutive equation to compute the material stiffness and the stress at arbitrary points. (10) Compute the tangent stiffness matrix. (11) Compute the residual (the extent to which the system is unbalanced) and assess convergence. (12) If not converged, return to step 2). If converged and the sign of has changed, use the bisection method to search for the singular point. Once the singular point has been identified with sufficient accuracy, confirm it by counting the number of negative entries of the diagonal matrix D obtained from the decomposition; then proceed to step (2) unless the maximum number of steps has been taken, in which case stop the calculation. As shown in Figure 2, the three-dimensional truss we considered consists of 24 segments and 13 nodes and is symmetric in the xy plane. To ensure that the load results in a symmetric displacement, the load is applied in the downward vertical direction to nodes 1 - 7, with the load at node 1 being half the load at the other nodes. All numerical experiments were carried out in double-precision arithmetic using the algorithm described above. Computations were performed on an Intel(R) Core™ i7 3.2 GHz machine with 12 GB of RAM, running Windows 7 and gcc-4.7-20110723-64 Fortran. We analyzed three computational procedures: equations (4) and (11) for dense matrices, and equation (11) for banded matrices. All three procedures yielded identical results. We verified that our proposed formula allows accurate calculation of the quantity . In what follows, we will discuss results obtained for the banded-matrix case. Figure 2. A three-dimensional truss structure model. where is the effective strain hardness, which is set to in our numerical experiments; is a parameter that controls the degree of smoothness, which is set at , close to bilinear point; and is the tangential stiffness at an arbitrary point  . 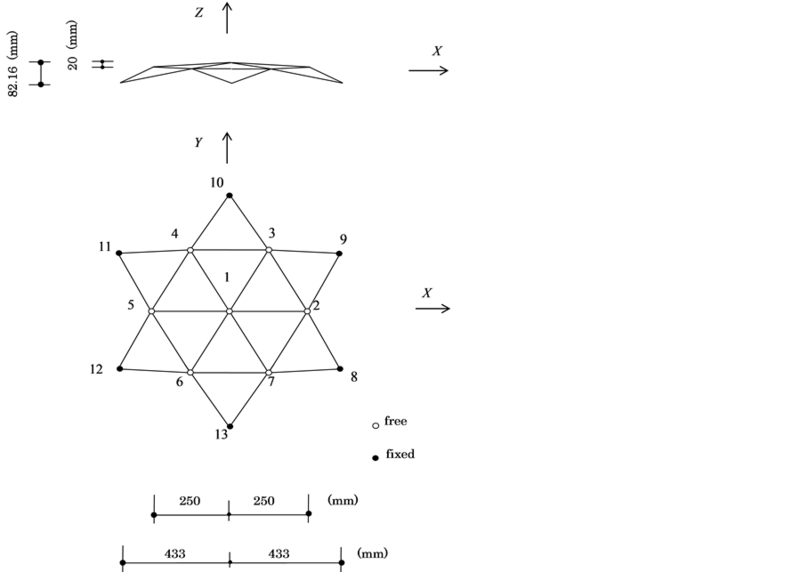 Here is the axial force, and are the indices of the nodes at the segment endpoints, and are the coordinates of nodes , and is the segment length. Figure 3 plots the load-displacement curve obtained using the proposed method. Figures 3 and 4 indicate the correct count of eigenvalues. A total of six eigenvalues appear before the limit point, with the sixth eigenvalue corresponding to the limit point itself. through are bifurcation buckling points, and is the limit point. The pair is a pair of multiple roots, as is the pair . If the number of subdivisions for the strain value constraint is too small, discrepancies in the number of zero eigenvalues detected by the proposed method can arise, causing some singular points to be overlooked. For this reason, we have here chosen , but high-precision nonlinear analyses require large numbers of steps. The method that we have proposed is a simple addition to the process of solving simultaneous linear equations and may be put to effective use in nonlinear analysis. Figure 3. Vertical displacement and load level. Figure 4. Vertical displacement and numbers of eigenvalue. method. In this application, we detect changes in the sign of the derivative of the determinant and then use the bisection method to narrow the interval containing the singular point. Moreover, because the solution obtained via the Newton-Raphson method varies with the derivative of the determinant, it is possible to use this quantity as the arc length. This then allows the arc-length increment to be determined automatically, which in turn allows a reduction in the number of basic parameters impacting the nonlinear analysis. However, as our numerical experiments demonstrated, when using the proposed method, it is necessary to impose a constraint on the absolute value of the maximum values of the strain or the relative strain, and to use the strain constraint to control the increment. The proposed method is designed to work with the decomposition and exhibits a significant reduction in memory requirements when applied to the decomposition of banded matrices instead of dense matrices. Numerical experiments on a three-dimensional truss structure demonstrated that the proposed method is able to identify singular points (bifurcation points and limit points) accurately using the derivative with respect to an eigenvalue of the characteristic equation of the stiffness matrix. This method does not require the time-consuming step of solving the eigenvalue problem and makes use of the solution to the simultaneous linear equations arising in incremental analysis, thus making it an extremely effective technique. Kashiwagi, M. (1999) An Eigensolution Method for Solving the Largest or Smallest Eigenpair by the Conjugate Gradient Method. Transactions of JSCES, 1, 1-5. Kashiwagi, M. (2009) A Method for Determining Intermediate Eigensolution of Sparse and Symmetric Matrices by the Double Shifted Inverse Power Method. Transactions of JSIAM, 19, 23-38. Kashiwagi, M. (2008) A Method for Determining Eigensolutions of Large, Sparse, Symmetric Matrices by the Preconditioned Conjugate Gradient Method in the Generalized Eigenvalue Problem. Journal of Structural Engineering, 73, 1209-1217. Bathe, K.J. (1982) Finite Element Procedures in Engineering Anaysis, Prentice-Hall, Englewood Cliffs, Nj. Richrd, R.M. and Abotto, B.J. (1975) Versatile Elastic-Plastic Stress-Strain Formula. Journal of Engineering Mechanics. 101, 511-515.